Ever noticed that you never seem to find the most important items at the worst possible times? I am talking wallets, keys, and other stuff. If this is your case, you are in the right place. You need a wallet/key tracker, which is what this guide is all about. It contains reviews of the top wallet trackers you will find in the market today. What’s more, as we approach the end, I have included a short buying guide that may be very handy in pointing you to the product for you. Mynt tracker is quite small, measuring 1 inch wide and 2.2 inches tall. It has a brushed-metal finish that adds a premium style. There is a small space for your key ring and a single button in the middle. It is easy to download and set up the application. The Bluetooth range on the unit is 150 feet. When the connection is lost, you get a notification on your phone and it saves the last location. You can then move back into range and use your phone to make the device ring. If you misplace your phone, and you have the device with you, just long press the button and your phone will start ringing and flashing lights. However, your phone must have its Bluetooth on otherwise it won’t work. Similar to all other trackers that use Bluetooth, this one has the community-search feature, where if you register your item as lost, anyone with the app can find it for you and send the location to you in an email. All this is done without them actually knowing the location of the item. The battery lasts for about a year and is replaceable. With a maximum range of 165 feet, the Evershop wallet locator is perfect for both indoor and outdoor use. It tops of this range with a very loud beep, rated 90dB. These two features mean that wherever your item is, be it under cushions, the other room, or a different floor, you will be able to find it. It blinks and flashes light as it rings for you to find it easier. With its very small size, you can take it with you almost everywhere. You can also use it to find your phone by double tapping the button on the unit. The best part about it, however, is its exceptionally low power consumption. This is responsible for its very long battery life, or over a year. Once they run out, they can be easily replaced. The tracker is made of sturdy materials so you can expect very long service from it. The Wohome key tracker excels in home settings. 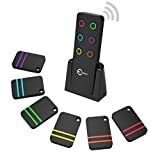 It comes as with six trackers with varying color stamps and a remote with six buttons, each with a color matching a receiver. Each of the receivers has both a key ring and a double sided sticker. This gives you a choice on the method of attaching. The double sided sticker allows you to attach to a remote or a key chain. When each of the button is pressed, it lets out a loud alarm, alerting you on the location of the item. This connection is quite sensitive, allowing you to detect stuff from up to 30 meters away. It uses very little battery power which will last for a year or so. When the batteries run out, you can easily replace them. Nut3 is a pebble-shaped device that can be attached to your wallet, key, pet, and even kids to alert you if they go beyond a certain range. This is usually 30 to 50 meters in an open area. The design of this key finder is focused more on loss prevention rather than finding lost items. This is evident from the loud sound alert when it goes beyond a certain range. The ability to set silent zones sets this key finder apart from the rest in this guide. This is done in the app (that you download after scanning the QR code in the packaging) by dropping a pin or entering an address. The silent zones are those that separation won’t trigger an alarm on both ends. It is available in four colors to match preferences and style. The Nut3 also makes use of the community search function to make sure your items do not remain lost. Anyone with the app could get in on the action. When you disconnect from the tracker, the app records the last known location to narrow down your search. 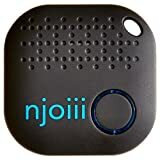 The Njoii Bluetooth wallet finder is super easy to set up and you will be done in under two minutes. When you misplace your items, you can use the phone app to make the tracker ring. It makes a loud noise, that you can hear it from under a couch. What’s more, it records the last known position on google maps to help you find it. What makes this different from the rest is it additional functionality. If you have your keys/wallet and you can’t find your phone, pressing the single button on the unit will make your phone ring. It is almost quite handy if you love taking photos as when you press the button, it takes a photo if the camera app is open. More interestingly, this unit prevents potential loss. It does this via its separation alarm which alerts you when you separate beyond a predetermined range, normally 20-30 meters. The package comes with an extra battery. Not that you will need to replace them anytime soon because it has a lifespan of about 12-18 months. 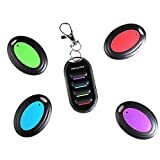 Uniclife key finder is the other best wallet trackers’ option if you want to keep tabs on more than one item in the house. It comes as a single remote, with four buttons of varying colors. Each button corresponds to one tracker, making them four in total. They are stylish and sleek looking so you can carry them around without worrying about aesthetics. The range of each of the units is 130 feet. With such a range, there is no chance of anything with the tracker staying lost for more than a couple of minutes. Just press the button that matches the color of the lost tracker and it will let out a sound and flashes to let you know how close it is. It uses very minimal battery power as it can last for a whole year without needing replacements. If you are looking for a small unit, something that adds no weight to your keys and/or wallet, this may be the one for you. It is a very compact unit, measuring less than an inch, and has a very sleek design with rounded corners. There are two colors available, each with different LED colors around the single button. It has an average range of 30-50 meters. Although much less than some of the items on this list, this is just enough for a home setting. It is easy to set up, and won’t take more than five minutes. When you lose your item in a certain area, say church, you can go there and start the searching process while looking at your phone. You will receive four proximity messages to let you know how close or far from the item you are. These messages are: “very far”, “far”, “close” and “very close”. After the last “very close” message, you can set off the alarm and go for the keys/wallet wherever the alarm is coming from. With this unit, you won’t have to replace the whole thing once the batteries die. You only need to remove them and install new ones as they are replaceable. 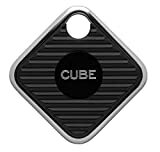 The cube pro key finder app has a simple and uncluttered user interface. Setting it up won’t even need the user manual included in the package. It has a Bluetooth range of 150 feet which is quite impressive. When staying connected to the phone, the battery has a life of one year, or two years when disconnected. Once you get out of the Bluetooth range, you get a notification, after which you can set it to notify you once it reconnects within range. It has a sound range of 80 dB. Though not very loud, it is just enough to reach the right ears. Unlike most other wallet trackers, cube lacks one very essential feature: the community search function. For this reason, while the item is very handy in home settings, it is almost useless outside as once the connection is lost, no one else can assist in your search. It, however, gives separation alerts. Chipolo is one of the few companies that pose a challenge to Tile company. With CHIPOLO best wallet tracker cards, especially, they achieved a fit that no one foresaw or even thought possible. They came up with a Bluetooth tracker that is twice the thickness of a credit card, and two-thirds its size. It has a single bunion at the middle. So slim it is, that it is mistakable for a wallet once it is slid into the wallet pocket, and adds no weight. It has quite an impressive range. You can find your lost items from a distance of 200 feet. By connecting it to the app, it will start chirping with an impressive 95 decibels so there is no way you won’t hear it. Chipolo also makes use of the community search function that allows everyone in the world to participate in your search without knowing it. Unfortunately, this unit doesn’t come with a replaceable battery so once it ends, the card is just another wallet decoration. It drains the battery in roughly one year. Most trackers discussed in this guide are great for tracking one or two objects at most. But what if you want to track 5 or 6 items around the house? 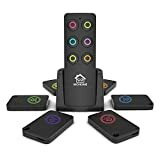 Do you get a tracker for each with its own separate remote? It is in this area that the Esky Key Finder excels in. It comes in a convenient pack of 6 trackers that you can attach to a number of items simultaneously. A pet, remote, wallet, keys, and other items you think are more likely to get misplaced at the worst possible time. The remote has six buttons with colors that match each of the trackers. When you misplace any item with the attached tracker, just press the button that corresponds to the color of the tracker and it will let out a powerful sound that can be heard from over 30 meters. Each tracker in the pack has its own unique ring. On the downside, these trackers are not that small so they may not be practical in some situations. There are many reasons why our top pick is the Tile pro wallet tracker but we will only look at a few. To begin with, this is by far the most popular wallet tracker. If you have heard of the crowd-finding feature, where somebody else with the app can find the item for you, then you understand the importance of numbers. It is quite small and made of a rugged material so it can sit in the wallet unnoticeable. It has an amazing Bluetooth range, with Tile advertising it as 300 feet. This is more than twice as long as some of the trackers in this list. It is amazing how much sound such a tiny item can produce. It is rated at 80.9 decibels making this the loudest in this guide. This is an improvement of older models which had to be replaced when the battery died. It comes with a removable battery and drains one in about a year. It is very simple to setup. When you disconnect from the item, you get a notification with the last location of the item before it got lost. You can also use the Tile pro to find your phone by double tapping the single button. The Tile (Gen 2) key finder is a compact and lightweight device measuring 1.45 by 1.45 by .24 inches. Like most of the others, it has a single button at the middle to connect to your phone. It is very simple to set up. It uses Bluetooth to search for the lost item, notifying you whether you are close or far away. You can also trigger the alarm for a faster search action. This device has a relatively impressive Bluetooth range of 100 feet. When you get out of range and disconnected, moving back into range will connect you automatically. This gen 2 tracker has a 90dB sound so there is no way you won’t hear it even if its under the chair cushion. It has a water resistant rating of IP5 so it can withstand rain and splashes, but not being submerged. You can also find your phone by double tapping the middle button. How far close does that item have to be in order to track it? Most trackers have a range of 60-80 feet, while others, such as our top pick, have a very wide range of 300 feet. It goes without saying, the longer the range, the better the wallet/key tracker. As you may have noticed from above, some units come as a remote/app with only one tracker/receivers. Other some as an app/remote with up to 6 receivers. The latter are more expensive than the former. That said, you should know what you intend on using the trackers for, then you will be able to determine the number of receivers are ideal for you. How does the receiver alert you? Is it via the map, audibly, or visually? If it does so via the map, it should have a precise location. If it uses audio, it should be loud enough to be heard from a distance and if visual, it should be visible even in constrained spaces. There are two aspects to batteries; the ability to replace, and the ease of replacement. 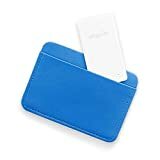 The wallet trackers that come without a replaceable battery are waterproof, but you will have to replace the whole unit once the battery gets depleted. Those with replaceable batteries are much more convenient and reliable, seeing as you only pop out the old battery and insert a new one. You should go for one that is easy to replace. Though not very important, the size and shape should be considered. You wouldn’t want to walk around with a tracker that is twice or thrice the size and weight of your keys. Or something that would make your wallet look bloated. A simple and inconspicuous tracker is the way to go. What are the extra perks from purchasing the unit? Some Bluetooth models allow crowdsourcing to find lost items. Others can be used to take pictures and others have extra app functions. The more the extra perks, the more valuable to you it will be. Our recommendation is the Tile (Gen 2) Key Finder for its extended functionality. It is lightweight, inconspicuous and has a pretty good range. When you sound the alarm, however, hidden or far away it is, you will definitely hear the 90dB sound. The final choice, however, rests with you. Happy hunting!